We’ve found that the best gas grill doesn’t need to be the most expensive. If you know where to look even some of the lower priced models can be found with stainless parts, extra burners, utensil racks and more. 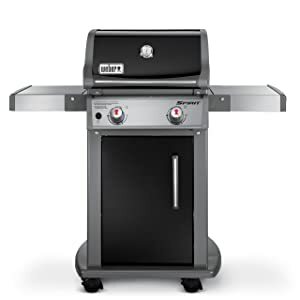 If you’re considering a new gas grill be sure to check out our buyer’s guide, gas grill reviews, and links to current discounts with free shipping. View this week's best deals on the best gas grill! Our job is to provide you with honest reviews and straightforward buying advice to help you find the best gas grill at the best price. We also factored in shipping, available discounts and customer reviews for all the best selling brands that made our “recommended” list. Our unbiased gas grill reviews should help you select the best gas bbq grill for your outdoor cooking needs. You can expect to pay between $100 and $300 for a reliable but lower priced bbq grill. 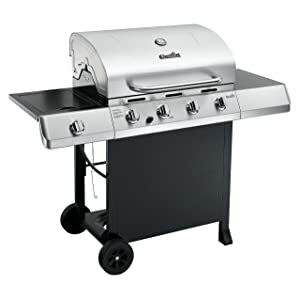 While $300 to $500 will get you a higher end – larger capacity gas grill with more stainless steel and better features. We found that most grills in the under $500 range provided the same overall performance and quality as some models priced much higher. Our gas bbq grill reviews looked for performance, quality of materials and construction, added table and burner space, and (of course) excellent value. Whether you’re looking for portable gas grills or even natural gas grills, we’ve got you covered. To help you in your hunt for the perfect grill, be sure to check out our buyers guide below for more information on the various options available. 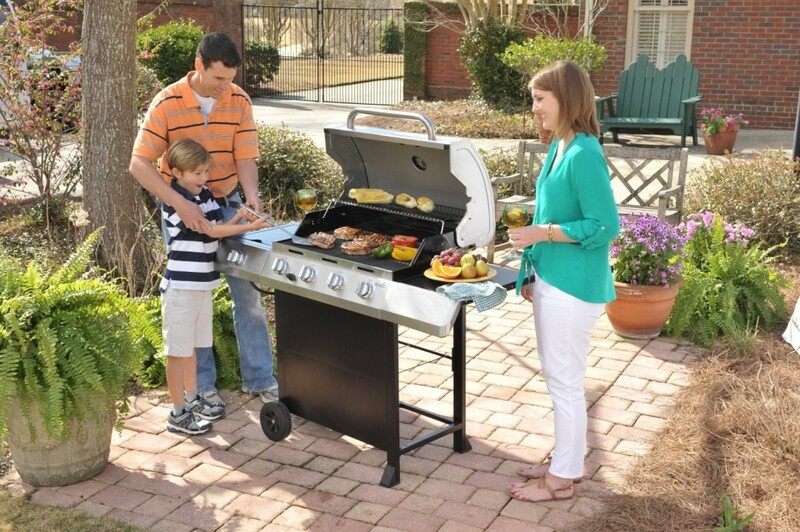 Learn more and find the best gas grill for your next cook-out! If you’re looking for natural gas grills, try adding a conversion kit to the Char-Broil Classic. This grill is a powerhouse. When you add in its side burner, you have access to 50,000 BTUs. The main grill is 480 square inches of porcelain-coated cast iron with an extra 180 square inches in a secondary cooking rack. The side burner provides even more space. The side burner comes with a lid, and there is another table surface on the opposite side of the grill. Both of these surfaces are made of sturdy stainless steel. Assembly is required for this one, and we did have to provide our own screwdriver. However, once assembled, this grill was solidly constructed and easy to move around on its two wheels despite its finished weight of 114 pounds. 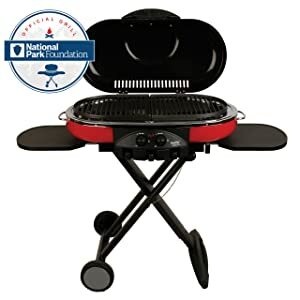 The Char-Broil Classic grill also comes with a grease tray to collect and store grease safely away from the heat source. Weber is known for making some of the best gas grills in the industry. This model comes in 2-and 3-burner options. The Spirit includes 360 square inches of porcelain-coated cast iron cooking space and a combined BTU of 26,500 for the 2-burner and 32,000 for the 3-burner. There’s also a 90 square inch warming rack that’s great for baking potatoes, toasting buns, and lightly grilling fish or vegetables. The Weber Spirit is one of the only gas grills that includes a grease management system to prevent dangerous flare-ups and to make cleaning even easier. Weber also included its patented “Flavorizer bars” that catch and heat fat drippings at just the right temperature to provide an extra smoky flavor. The fuel gauge proved especially useful in determining when the propane tank was low. This was one the best portable gas grill we reviewed. When folded, it was 36x22x13 inches, making it the perfect size to fit in the trunk of the car with all of the food and beverages. This is a great grill for camping. It works great, perfect size and high quality. It also was compatible with both 16 oz and 20 lb propane tanks. The two burners run at 10,000 BTU each, which was a great amount of heat for its 285 square inches of porcelain-coated cast iron grates. A handy grease-catching tray made clean up a breeze. Surprisingly, this portable gas grill even includes removable side tables for extra work space and built-in hooks to hold tools. When collapsed, the wheels on this grill allow you to tow it around like a wheeled suitcase. You can also purchase separately a cast iron griddle accessory that replaces one half of the grate. This provides a great place for pancakes, stir fry and other cooking options. All in all, this one is superb for campers, tailgaters, and others who need a solid travelling grill. If you’re looking for something higher end with a great aesthetic, this is the grill for you. This Dyna-Glo gas grill is a beautiful combination of stainless steel and bronze colors. 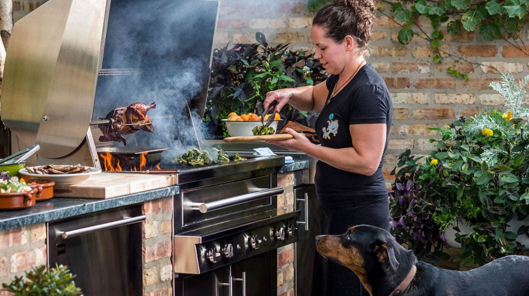 At 708 square inches of cooking space, it was the largest of any of our gas grill reviews. This is a good performing grill and good looking too. This is great bbq grill for you. There are 5 burners that rate at 10,000 BTUs each plus a smaller side burner at 12,000 BTUs. The grates are made of thick, commercial grade stainless steel. With this model you’ll also receive the stainless steel heat tent, which helps collect and vaporize dripped juices for additional flavor. The propane tank is held on a sliding rack that makes tank replacement much easier than conventional set-ups. 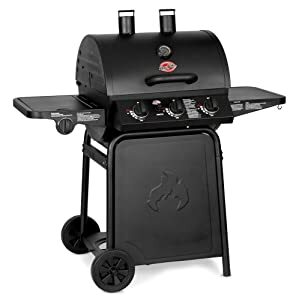 Overall, this model is one of the best gas grills out there, and the price makes it an incredible value for all it offers. For the price, the 3-burner Char-Griller 3001 is hard to beat. It’s a great beginner’s grill, but it also still boasts the 40,800 BTUs that an experienced griller seeks. The main grilling area is 438 square inches, not including an additional 192 square inch warming rack and a side burner that’s great for a small saucepan or pot. The racks are high quality porcelain-coated cast iron. One side is specially and effectively designed for searing. The side table includes hooks for tools. In short, this gas grill has everything you need without all of the added expense. As far as gas grills on sale go, this is can be the perfect one for any home and any budget. Once you know about the requirements, you can go ahead and look into the three main types of grills namely, gas, electric, and charcoal. As per the data with Hearth, Patio & Barbecue Association (HPBA), gas grills occupy almost 60% of the market share, while electric ones have 7%. The remaining share is of the charcoal delights. Further, it is commonly believed that owning a charcoal and gas grill is ordinary. However, if you reside in a condominium or in an apartment that will not entertain smoke or fumes, an electric grill is the only option for you. Is the most famous BBQ appliance, perhaps because of the fuel source, propane that is safe, easily available, and efficient. Arguably, the best justification for using a propane grill is that it makes your appliance highly portable, which eliminates the need to buy two different barbecues, one for outside guesthouse and one for home. Talking about the performance, these grills heat up instantly and consume higher British Thermal Units (BTUs) for cooking. Available with multiple burners with different temperature controls for cooking at different temperatures, these grills make it easier to retain an accurate temperature control. Some more features include storage cabinets, side burners, and temperature indicators. Is the recent vogue perhaps because it ensures an infinite supply of fuel. Obviously, a natural gas barbeque is costlier than a propane grill but this is an offset, as you do not invest in propane tanks for refilling the fuel. 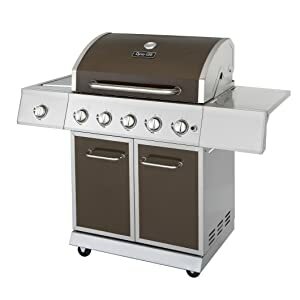 However, like the propane barbecues, these grills heat up quickly, consume highest BTUs, and come with temperature indicators, side and back burners, and storage cabinets. Just ensure that a natural gas line connection exists to the grill and that the hose is lengthy enough to be hooked up. Further, a hook-up for natural gas needs to be set up by a licensed professional. Is for those who love the typical smell and taste of charcoal grilling. Here, you have two options: Using the known charcoal briquettes made up of sawdust, compressed coal dust, woodchips, and charcoal or using natural charcoal, hardwood to be burned. Regardless of which one you choose, both are ignited and burned during which heat-radiating embers are generated. Charcoal grills might take time to heat up but the smoky aroma is what attracts the barbecuing enthusiast. They can even cook at high temperatures to lock juices or at slow ones to emit the genuine smoky flavor. Is powered by an electrical outlet that means no need of other heat sources such as gas or charcoal. It is ideal for a griller at home, who is in search of easy and convenient BBQ. The unique aspect of this type of grill is that it is flexible; you can use it at places where gas might be infeasible at outdoors. However, you can even consider it for indoor use. Is equipped with infrared burners as an extra feature. Infrared heat, in this appliance, comes from a radiant source instead from hot rising air (convection) seen in traditional grilling. Because of infrared elements, this grill heats up faster than other types. In case you are going to use infrared grilling for the first time, it is recommended to read the directions carefully and monitor your cooking until you master using the appliance. When wanting to choose a perfect barbecue grill, there are many types of aspects to consider. That is because there are many brands of barbecue grills that a person can include in his own choices. Still, the gas barbecue grill seems to complete a lot of benefits and features for all people that want to have such a device in their own home. So, here are some of the best aspects regarding the barbecue grills that work with gas. They might seem to be the most reliable solutions that are clean and that do not consume too many resources for heating the food. This means that any person can get the chance to have a grill that can last for a longer period of time. Also, it is quite resistant to heat for a person to cook the wanted meals right away. Depending on the chosen brand and type of gas grill, there are different materials that make each one of them quite priceless. Stainless steel is one of the most important materials that producers used for a high quality type of barbecue grill. Another feature of the barbecue grill that is based on gas is the idea that it produces instant heat for any type of food. This fact includes the idea that a person will not have to wait for a long period of time until the food is cooked. Instead of this, a person can get the chance to cook the perfect meat or vegetable immediately. There are even barbecues that a person can set to the wanted temperature for the food to be cooked in the right way. For sure the results can lead to delicious food that will turn any moment into a special event. What is more, it is that a gas barbecue grill is suitable for all kinds of outdoor spaces such as gardens. According to the wanted type of size, any person can have such a product in order to use it whenever he wants. This fact will allow for all barbecue lovers to have their own barbecue parties at their own home without any other aspect involved. With a simple usage and a lot of quality in the production of it, there is no doubt that the gas barbecue grill is capable to give the best results for all clients around. Just remember to purchase a barbecue that has a great quality, for all these aspects to be included in its own advantages. The truth is that the gas barbecue grills are an ideal solution for many people that consider purchasing a barbecue grill designed for outdoor spaces. Therefore, with all these features to consider, for sure any person can cook the wanted barbecues at its own home all the time. And for a plus of making more economy, a person can make more research about different offers available everywhere. With a lower price and a greater quality, there is no doubt that any person can enjoy these great tools more. When you’re choosing a gas grill, more BTUs is not necessarily better. This really depends on how much you’re going to be cooking at any one time. If you tend to stick with burgers and hotdogs, you don’t need an incredible amount of heat. Remember also that higher BTU usage is equal to more fuel consumption. You’ll be refilling your propane or natural gas tank more often, especially if you’re firing all of the burners at the highest settings. A side burner is usually placed on a table-like surface that extends from the side of the grill. The side burner is great for toasting buns at a lower heat than the surface of the main grill. It’s also useful for whipping up a batch of gravy in a small sauce pan. Most side burners have a fold-down lid, so when it’s not being used, the area is also good for temporary storage of tools or serving platters. The best gas grills provide secondary cooking space. This is usually in the form of a rack that hangs over the main grilling area, providing more square inches of grilling space. 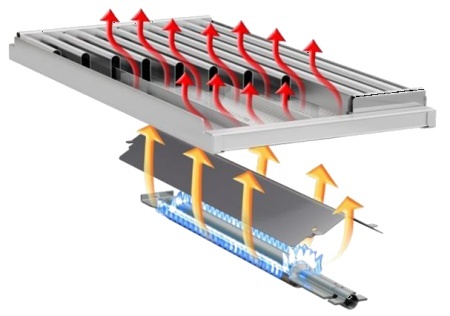 The heat is more indirect because the rack is farther from the main heat source. This makes it a great space for cooking vegetables, “baking” potatoes, toasting bread, roasting corn, etc. Referring back to the BTU rating, you’ll want to look for around 100 BTUs per square inch. This is a good baseline of heat production. First you want to look at the main cooking area. If there is a secondary cooking space, subtract that square area to arrive at the area of the main grill. So if the grill advertises 700 square inches of cooking space with 530 being part of the main cooking area, you want around 53,000 BTUs. Models with exceptional insulation, however, can use energy more efficiently and don’t need as many BTUs. Some gas grills are capable of running on either propane or natural gas. If you are looking for natural gas grills, don’t assume a propane grill will work. You may need to purchase a separate conversion kit to run a propane grill on natural gas. To use natural gas, you’ll need a direct gas line from your home. Sometimes newer construction houses will have an external line near the backyard that is meant to hook up a natural gas grill or fire pit. If you do not already have a line set up, you’ll have to pay someone to run a line for you. You can contact your gas company for a list of certified contractors who are qualified to do this work. Natural gas is a tempting option if you can get it, because it costs up to 83% less than propane fuel. Because it runs from the home’s line, you’ll also never run out. There’s no last minute trip to the store to refill tanks. Keep in mind that natural gas has a lower BTU rating than propane. That is to say, natural gas produces less heat per pound of gas than propane. You’ll have to use twice as much natural gas to get the same heat. However, because natural gas is so much less expensive than propane, this is still a net savings. Grates are usually made of stainless steel, cast iron, porcelain coated cast iron, porcelain coated steel or plain, untreated steel. Untreated steel can be thin and prone to chipping. Its thinness also means it does not retain heat well compared to other materials. Stainless steel will last longer, but it can also be susceptible to chipping depending on how thin it is. Even microscopic chipping can cause food to stick. That being said, a stainless steel grate should last you at least 5 years or more, especially if you properly clean and care for it. Porcelain coated cast iron and steel last even longer, but quality means everything. Poorly made porcelain coatings can rust, especially if they’re not properly maintained. Make sure to never use a metal scraper on a porcelain coating. This can permanently damage the coating. You can still use a stainless steel grill brush. To avoid hard brushing, heat the grate up first to help loosen the burnt-on gunk. Probably the best gas grill grate material is plain cast iron. Cast iron will last for ages with proper care. It is very durable, and it is thick and heavy so it will retain higher heat for longer periods of time. It also tends to be expensive. These features are great for storage and organization. Side shelving is a good place to set down food, plates and condiments. Built-in tool holders will usually be found as small hooks underneath the side tables. Portable gas grills are great for family picnics, tailgating and other gatherings. There are essentially two modes of portability: fold-up or wheels. A fold up grill, like the Coleman Road Trip LXE, is specially designed to easily collapse to fit in the trunk of a car. It also includes wheels to roll the entire unit in its compacted state. That’s why we selected the Road Trip LXE as the best portable gas grill. Other gas grills are designed more for wheeling the unit from the garage to the driveway and back. They include wheels on one side that allow you to tilt and roll, but they are still generally too bulky to easily fit in the car. To bring one of these grills to a friend’s house, you’d most likely have to partially disassemble the grill or use a pickup truck bed. Excess fat that drips onto open flames can cause flare-ups. These can be dangerous if they are not carefully controlled. 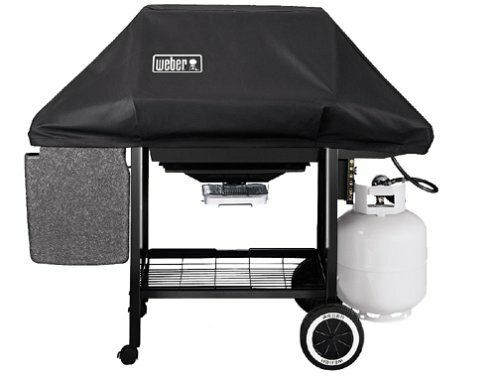 Some gas grills, like the Weber Spirit, include a grease management system that funnels grease into a removable pan. This is an excellent safety feature, and it also makes cleaning and maintenance easier as well. Remember that water is not your friend when it comes to putting out a grease fire. If you do experience a significant flare-up, close the lid of the grill, turn all of the burners off, and try to kill the fire by removing its source of oxygen. If all else fails, keep a box of baking soda or a fire extinguisher nearby. 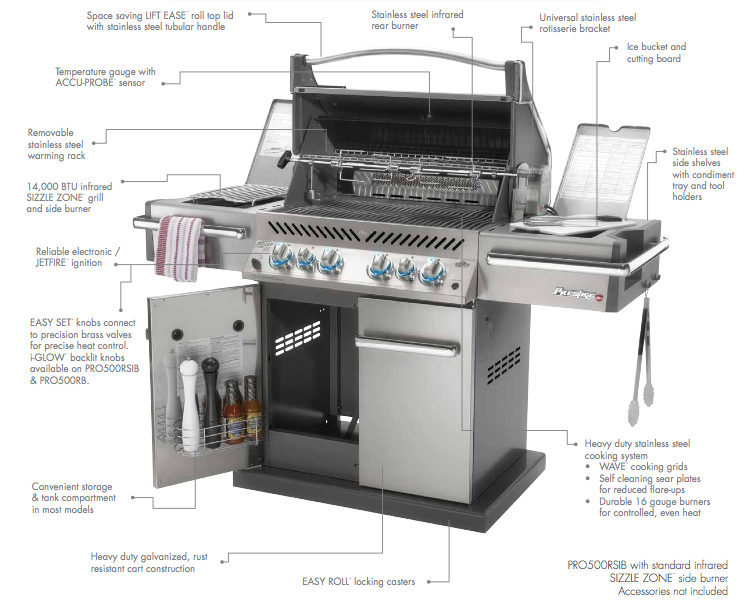 We’ve listed warranty details in most of our gas grill reviews. Warranties are very important to consider when you’ve narrowed the field down to two or three natural gas grills or propane grills. Some warranties are limited to manufacturer defect. Length of time is another factor. A warranty may be good for 6 months or up to 5 years for the best gas grills. The manufacturer may also offer split warranties, where the burners are guaranteed for a longer period of time than other parts of the grill. In case you have already made an investment by purchasing a barbecue grill, there is no doubt that you may also want to protect the investment for a long period of time working. So, in the case of barbecue grills, there is no doubt that an efficient cover can have all features for the grill to be easily maintained all the time. This will increase the lifespan of the grill and preserve its good qualities. Investing in such a cover is a smart thing to do for many reasons. First of all, there are many people that choose to place their barbecue grill outdoors. Whether they are in the garden or on a terrace, there are many areas to consider when wanting to place a certain barbecue grill. So a cover is specially designed for your barbecue to be protected against natural elements. In case of rain or even storm your barbecue will remain protected once it is covered with the right cover. This means that a person will keep a good maintenance of it, for the results to stay in a high quality state all the time. Furthermore, such a barbecue grill cover is capable to protect the grill against any kind of weather because of the elements included in the material. So these elements make the cover to be highly resistant at water or excessive heat. Depending on the size of the barbecue, any person can choose to have the right cover that can be placed over the entire grill. Also, for sure it may be quite dangerous to let different animals approaching to the barbecue. That is because they can let all kinds of bacteria on the surface of your barbecue grill. So, the cover will make sure that animals or insects will not get the chance to touch the surface of the device. You can cook all the time the perfect food without having to take intoaccount all types of dangers around the house. In addition, when using a barbecue there is no doubt that a person also has to use different utensils. But with a great cover all these tools will be protected together with the entire barbecue. Therefore, a person will not have to place the utensils in another part but near the barbecue. What is more is that the cover can be purchased in any color for a person to keep the good look of the area even when the barbecue has to be fully covered. To conclude, a barbecue grill cover can turn into a quite efficient product for any person that already owes a barbecue grill. According to the wanted type of cover, there are many prices and retailers to consider for any person that wants to have such a useful tool at a very affordable offer. So, while your barbecue will be protected against any type of external harm, you will be capable to use it for a longer period of time because of the quality that such a cover shows. Grilling should be a fun, tasty experience. You shouldn’t have to break the bank to enjoy freshly grilled food. You also shouldn’t have to sacrifice quality to find gas grills on sale. That’s why we researched and rated dozens of popular brands and models to provide the best gas grill reviews. Whether your primary concern is the square area of the grilling space or the portability for tailgating, we have selected a top performing grill just for you.